NYC, 03/05/2019, 7:00PM. 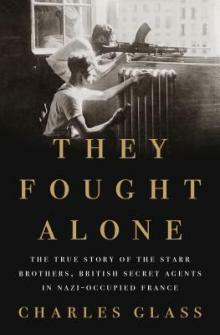 They Fought Alone: The True Story of the Starr Brothers, British Secret Agents in Nazi-Occupied France. From Charles Glass, the bestselling author of Americans in Paris and The Deserters, comes the astounding story of Britain's Special Operations Executive, one of World War II's most important secret fighting forces. As far as the public knew, Britain's Special Operations Executive did not exist. After the defeat of the French Army and Britain's retreat from the Continent in June 1940, Prime Minister Winston Churchill created the top-secret espionage operation to "set Europe ablaze." The agents infiltrated Nazi-occupied territory, parachuting behind enemy lines and hiding in plain sight, quietly but forcefully recruiting, training, and arming local French résistants to attack the German war machine. SOE would not only change the course of the war, but the nature of combat itself. Of the many brave men and women conscripted, two Anglo-American recruits, the Starr brothers, stood out to become legendary figures to the guerillas, assassins, and saboteurs they led.